Ergotron is showing off several recent additions to its education-focused device management, mounting and mobility lineup at the FETC 2014 conference taking place this week in Orlando, FL. Included in the lineup are the newly launched WorkFit-A and WorkFit-P workstations for Apple and the Tablet Management Station 16. 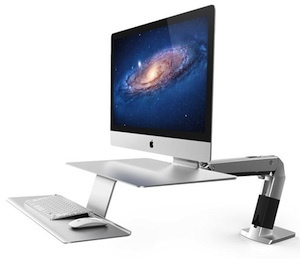 The WorkFit-A and WorkFit-P workstations for Apple are height-adjustable computer stands designed specifically for Apple iMac, MacBook and Mac mini. The Tablet Management Station 16 is a USB charging and synchronization station that can support up to 16 iOS, Fire OS (Kindle) or Android tablets. Tablet charging carts for tablets that support up to 48 Windows, Android, iOS or Chrome OS devices. Ergotron is exhibiting in booth 850 in the FETC exhibit hall.